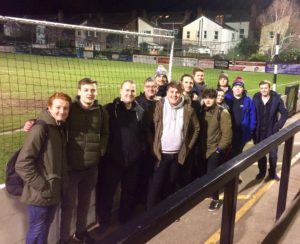 JMU Journalism sports students made their collective live reporting debut on Tuesday night as they watched Tommy Lawson’s wait for his first Marine FC victory extended, following a 1-0 home defeat at the hands of Workington AFC. 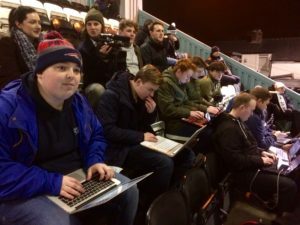 The footballers on the field were no doubt accustomed to the glories of Great Britain’s icy weather conditions, but the same couldn’t be said for some of the budding journalists in attendance. Nevertheless, a warm and welcoming feel to the football club – from the supporters, to the staff behind the bar and in catering, right through to the manager and the players – helped light up what was a bitter night as part of a valuable learning experience under the lights at Crosby’s Marine Travel Arena. 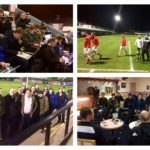 With laptops resting on knees, teeth chattering and phones in hands, the task was simple; produce a written match report of the Evo-Stik League Northern Premier Division game, and a TV package to boot. There were no video replays to rely on, and certainly no colourful commentary from Clive Tyldesley or Martin Tyler to help shape their reports. This was not a DVD version as the students had practised with in class – it was real, proper football. 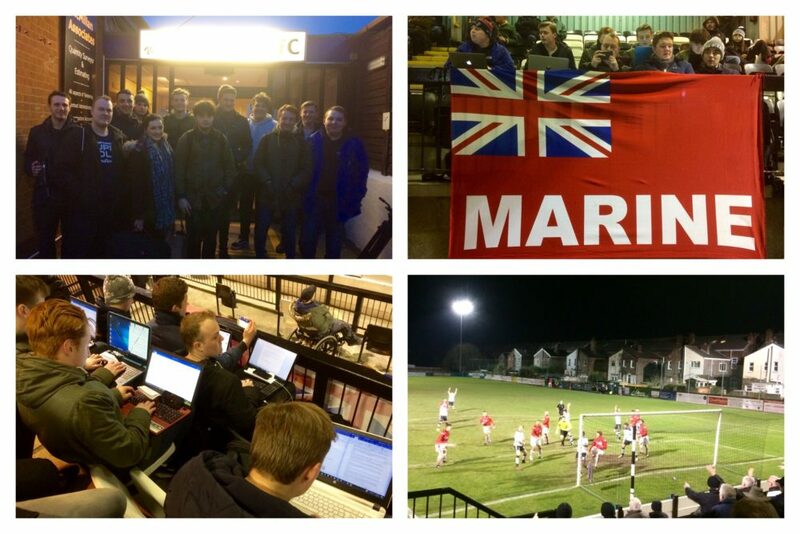 Both teams set up in a compact and organised manner, but Marine struggled to keep possession. Workington’s pressing made it difficult for the Mariners to get a foothold, as Derek Townsley’s side looked to make an instant impact. Samuel Joel produced a fine moment for the visitors. The forward was slipped in by Scott Allison down the left channel, showed great footwork to wriggle between Paul Foy and Adam Hughes, but his shot was batted away by the experienced Paul Phillips. The Reds from Cumbria had the ball in the net just before half-time, but Kyle May’s header was ruled out by referee Wade Smith for a foul. The second-half looked much brighter for Marine, as substitutes Alfons Fosu-Mensah and Matthew Hamilton brought speed into the equation. However, one defensive lapse proved costly as Joel built on his outstanding first-half performance by scoring in the 55th minute. Adam Hughes misjudged a long driven ball from James Earl, and the forward found space to tuck it underneath the advancing Phillips to make it 1-0. It was almost an ideal response by debutant Fosu-Mensah when he latched onto a corner, but the Dutchman’s header was cleared off the line by Allison. 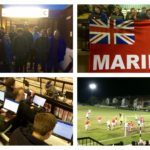 A late surge wasn’t enough to set up a grandstand finish and Workington travelled back north with all three points, leaving Marine facing a battle to stave off relegation. 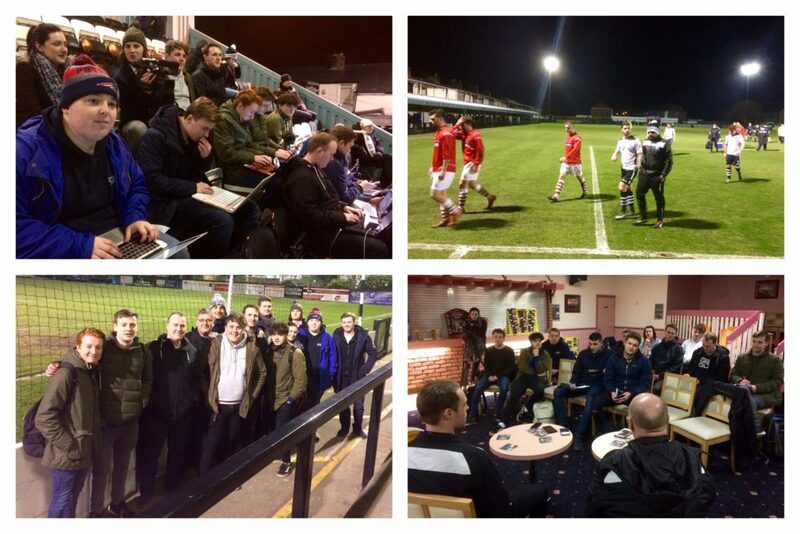 Next up for Marine is Ashton United at home on Saturday, and their relatively new manager is expecting a reaction. Lawson told JMU Journalism: “Paul Phillips has played over 700 league games for them, so I can guarantee he’s going to be up for this game like you wouldn’t believe.